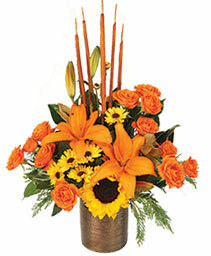 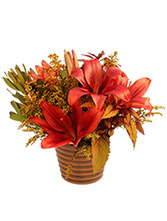 A Fall arrangement of Orange lilies, orange alstromeria, yellow button poms, peach roses,fall leaves, and varigated greenery with two rust colored candles designed in a hand-glazed stonewear serving dish. 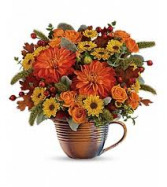 (microwave and dishwasher safe). 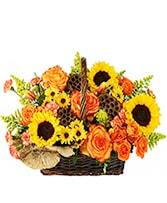 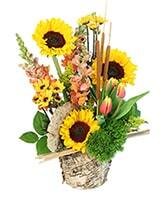 An Arrangement of red daisies, sunflowers, orange roses, yellow button poms, blue thistle, cinnamon sticks, wheat, and various greenery designed in a cornacopia basket. 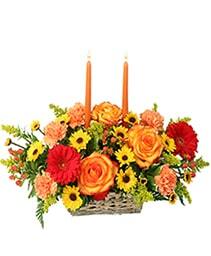 Great arrangement to send for a Thanksgiving Celebration. 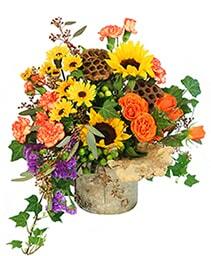 A Fall arrangement of spray roses, spider mums, daisy mums and seasonal greenery designed in a polyresin cube with a tree bark texture. A Thanksgiving Centerpiece with 3 roses, asiatic lilies, alstromeria, and daisy mums designed in a hand-glazed stoneware(Microwave, oven, and dishwasher safe) with 2 dark burgandy candles. 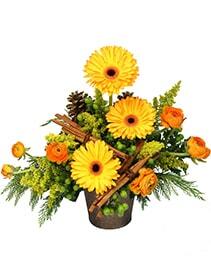 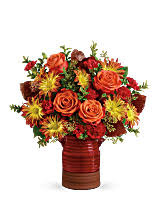 An arrangement of yellow viking poms, orange daisies, red hypericum berries, green button poms, orange spray roses, fall leaves, and various greenery designed in a clay pot. 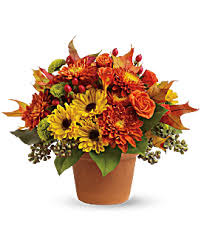 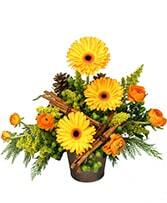 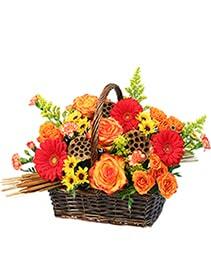 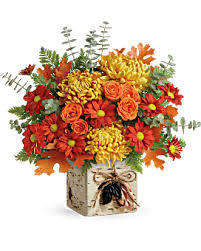 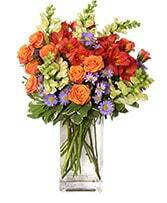 An arrangement designed for any occasion for anyone who loves fall colors. An arrangement of yellow/orange roses, viking mums, red daisies, solidago and various greenery designed in a ceramic keepsake pumpkin. 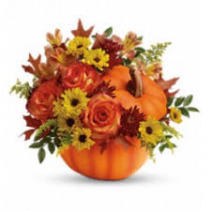 An arrangement great for any fall celebration. 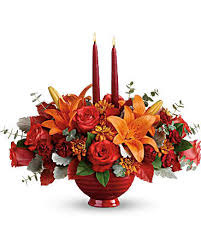 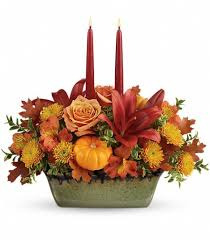 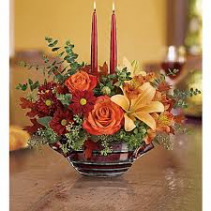 A Thanksgiving Centerpiece of roses, lilies, daisy mums, and mini carnations with mixed seasonal greenery designed in a hand-glazed stoneware serving dish (FDA safe for food and Microwave, oven, and dishwasher safe) including 2 dark burgandy candles. A Fall arrangement of sprayroses, spider mums, viking daisy poms and mixed seasonal greenery designed in a hand-glazed stoneware measuring cup(FDA approved to safely serve and store food, and dishwasher safe. 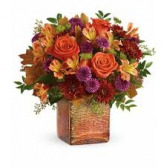 A fall arrangement of orange roses, orange alstromeria, purple button poms, red daisies and various greenery designed in a fall colored glass cube. Great to celebrate any fall occasion. An arrangement of orange roses, red mini carnations, fall daisies, solidago and various greenery designed in a hand glazed stoneware kitchen crock. 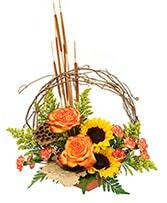 A great arrangement to send for any occasion with a container that can later be used for a kitchen utensil caddy. 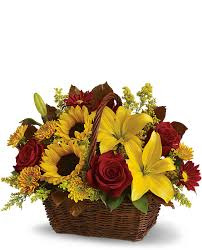 An arrangement of yellow lilies, sunflowers, red daisies, butterscotch daisies, solidago, red roses, and various greenery designed in a wicker basket. 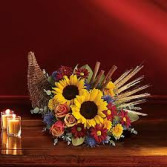 An arrangement suitable for any occasion.